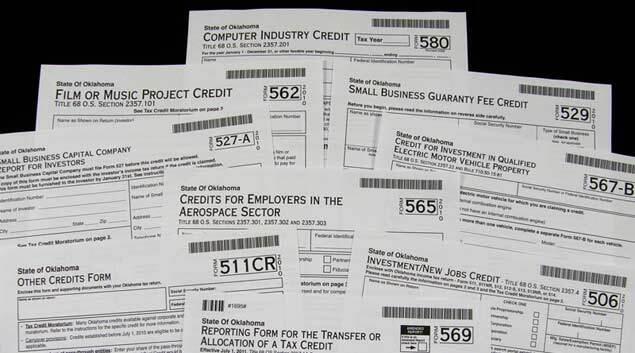 Oklahoma offers a number of tax credits for a variety of business ventures, investments and purchases. Recipients range include aerospace employers, coal mine operators and Hollywood movie makers. An existing moratorium on nearly 30 tax credit programs should be extended for another year and should be expanded to include all tax credits, the chairman of a legislative task force on tax credits said Wednesday. The proposed moratorium, which would run from July 1 through June 30, 2013, would free up about $150 million and would give lawmakers time to review the recommendations of a task force establishing conditions and requirements that companies must meet in order to receive economic incentives, said Rep. David Dank, chairman of the Task Force for the Study of State Tax Credits and Economic Incentives. Half the savings from freezing the tax credits could go to a program that would pay incentives for companies that bring in new jobs or provide for existing jobs, said Dank, R-Oklahoma City. The remainder of the money could be used to offset revenue lost by reducing a percentage of the state’s personal income tax rate. “There’s a lot of waste in these programs so that part of it can be used to be returned to the taxpayers,” he said. Several oil and gas drilling tax incentives that legislators extended earlier this year to 2012; the Quality Jobs Act, in which companies can receive quarterly cash rebates of up to 6 percent of payroll after creating jobs with health care benefits and above-average wages; and the aerospace engineer incentive program, which was originally included in the moratorium but was restored this year, would not be included in the proposed freeze, Dank said. “There is a general consensus here that says tax incentives that create real, lasting jobs are worthy, while those that fail that basic test are not,” Dank said. Legislators in 2010 placed a two-year moratorium on nearly 30 tax credit programs to help deal with significant state revenue shortfalls brought on mostly by the national recession. The moratorium is scheduled to expire June 30, the end of this fiscal year. The task force, which met 10 times since July, completed its work Wednesday.Its recommendations, which will be sent to legislative leaders and the governor, highlight the need for more transparency and for more reviews of economic incentives given to companies. Members hope the recommendations will be developed into legislation that will be considered in the upcoming session, which starts Feb. 6. Gov. Mary Fallin, who has said she supports eliminating tax credits that fail to produce or retain jobs, said Wednesday she looks forward to reading the panel’s report. Dank said that he prefers performance-based incentives. Task force members added increased transparency and prior approval for projects eligible for incentives. Dank said the current system seems “to be almost automatic” with no future cross-checking in the re-approval process for recipients. He would like to see a pre-approval board made up of state officials. “My definition of transparency is that everyone involved sees and knows exactly what is going on and what is at stake, down to a dollar-by-dollar accounting of where these credits and incentives are going and what they are achieving,” he said. Dank said it was important for the task force to come up with criteria to use to determine the value of economic incentive programs, instead of selecting which ones should be ended. Legislators, if they adopt the recommendations, should find the criteria helpful in determining which programs are benefiting the state. He said he hopes lawmakers agree not to continue two tax credit programs that caused the state to lose more than $275 million in revenue during a three-year period. The two incentive programs — the small business tax credit program and the rural venture capital program — have been suspended. They are included in the existing moratorium and are scheduled to expire at the end of this fiscal year.